The part of a ritual known as "Cakes and Ale" is often celebrated in some NeoWiccan covens as a way of thanking the gods for their blessings. Cakes are usually not cakes at all, but instead, cookies prepared in the shape of crescent moons, and the ale can be alcoholic or it can be apple cider, juice, or even water. Both items are typically consecrated by the priestess or priest who is leading the ceremony - it's more than just snack-time, it's a relevant part of the ritual experience. In many traditions, the Cakes and Ale phase of ritual is done at the end and can be used as a way of grounding out excess energy that may have been raised. In other groups, Cakes and Ale is done immediately after the gods are invoked into the ritual - it's a way of taking communion while welcoming them. In still other belief systems, the Cakes and Ale represent a symbolic version of the Great Rite. There's a great article by Aislynn over at Roots of Ritual that goes into significant depth on the purpose and background of the Cakes and Ale ceremony. It should be noted that Cakes and Ale seem to be a tradition most often found in Wiccan groups - non-Wiccan Pagan traditions seem to not focus on it quite as much. Obviously, do what your tradition guides you to do. Cream the butter in a large mixing bowl. Gradually add the brown sugar and mix well. Add eggs, lemon juice, and rind. Mix until well-blended. Stir in flour and walnuts. Cover and refrigerate overnight. When chilled, shape dough into crescent moons and place 3" apart on greased cookie sheet. Bake at 375 for 8 -10 minutes. Allow them to cool before serving. If you like, sprinkle them with powdered sugar or cinnamon sugar as they cool. 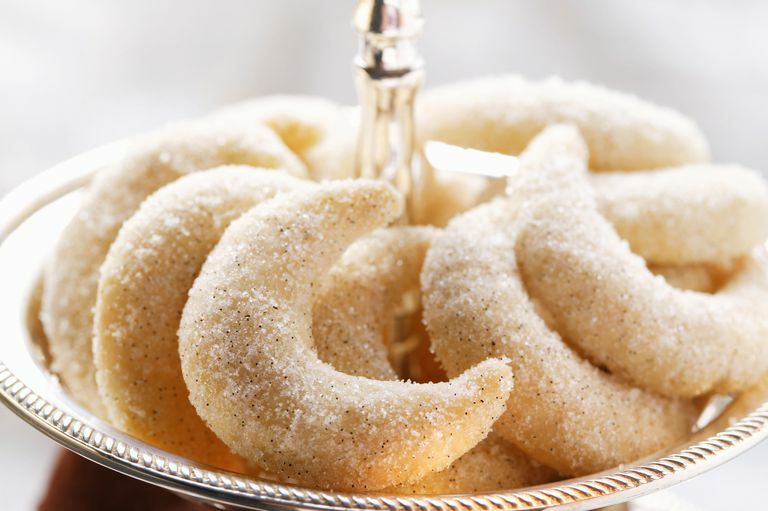 Make these crescent-shaped cookies to celebrate during an Esbat rite, or for your Cakes and Ale ceremony. You can dip them in chocolate or decorate them with frosting and silver sprinkles for an added bonus! Blend flour, baking soda, and baking powder together. In another bowl, cream the butter and sugar together. Add the egg to the butter and sugar and mix well. Add vanilla extract. One cup at a time, add the flour mix into the wet ingredients. Mix until it's nice and doughy. Flour your hands, and roll dough into pieces about the size of a golf ball. Squash it down and shape it into a crescent, and then flatten it down. Another option is to roll the dough out and cut it with crescent cookie cutters -- be sure to flour your cookie cutters before you use them, or the dough won't come out as well. Bake on an ungreased baking sheet at 350 for about ten minutes, until the sides begin to brown. Blend the cream cheese and butter together, and then gradually add in the powdered sugar. Add the vanilla and mix well. Blend in the milk (add a little more if your icing doesn't seem creamy enough). After your moon cookies have cooled, use this to frost them. Optional: add silver sprinkles to your cookies while the frosting is still wet, or dip half the cookie in chocolate and frost the other half in white. When it comes to the ale part of "Cakes and Ale," you've got a lot of different options. You can use water, wine, or even brew your own mead. The whole point, though, is that this is part of a sacred ceremony, so whatever you use should be consecrated at some point, usually prior to the beginning of the ritual. Also, consider safety and hygiene concerns, when you're passing the ale around - is everyone comfortable with sharing a cup, or would your guests prefer to have their own cup filled from a communal bottle?